Big Skies Guest House, a comfortable, family run guesthouse offers bed and breakfast accommodation in a relaxed friendly enivironment. We provide our guests with a true home from home experience. Big Skies is situated in the heart of Gordons Bay, and is just a 2 min walk from the beach. We offer free WiFi throughout and have secure gated parking. Big Skies Guest House is a short 300m walk from Gordon’s Bay main beach. When staying at Big Skies, beachfront parking is never a problem, you can leave your car in our safe parking area! The main beach road is edged by many excellent restaurants, taverns, ice cream parlours and shops. Our guest house is close to all the amenities, but just far enough back that you can retreat to a haven of peace and quiet. Gordon’s Bay is situated between between clear blue ocean and breath taking mountains. Many famous Cape landmarks are closeby, making it the perfect home base for your South African holiday. Our little jewel of a village is only 40km from the airport and 50 km from the city of Cape Town. A top tourist destination, Gordon’s Bay boasts many golf courses closeby. You can enjoy a wine tasting or cellar tour in the local Helderburg wine region, just a short 10 minute drive from Gordon’s Bay. The famous Stellenbosch, Franschhoek and Paarl wine routes are all within easy driving distance as well. We are the ideal spot from which to explore everything the beautiful Western Cape has to offer. “Drop Anchor and Discover the Cape” with us!! Gordon’s Bay is the gateway to the Whale Route. Hermanus, famous for whale watching, is just 70 km up the coast. Clarence Drive, the coastal road from Gordon’s Bay towards Hermanus, is one of the most scenic drives in the country. It features stunning coast line and beaches, and is not to be missed! This road and many other mountain passes are a great draw for bike fans (we are a bike friendly venue with gated off street parking). All the comfy rooms in our guesthouse have air-conditioning. They are also equipped with fridge, 32″ flat screen TV with selected DSTV channels. You will find complementary coffee and tea making facilities in all rooms. Each room has a private bathroom fitted with a shower over the bath, and free toiletries. Other extras include a room safe and hair dryer. Big Skies Guesthouse has FREE Wi-fi throughout. We also have a lovely private pool area where you can relax and soak up the sun in our mediterranen climate. A lounge, kitchenette and braai area (with outdoor table and chairs), is available for our guest’s to use. In summer our upstairs bar area is open in the evenings. The bar and balcony have spectacular sea and mountain views – perfect for enjoying a glass of wine or a cold beer as the sun goes down! A hearty breakfast is served every morning. Big Skies Guest House Gordons Bay is close to the N1 and N2 national roads which link to the many of the lovely places in the Western Cape. Secure free gated parking is offered at the guest house. Please check our Specials & Updates tab for all the latest accommodation specials, events and updates at Big Skies Guesthouse Gordons Bay. 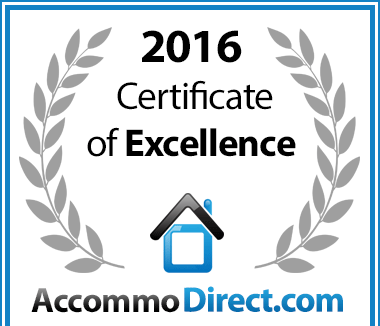 In recognition of exceptional service Big Skies Guesthouse in Gordon's Bay, Helderberg is hereby awarded a Certificate of Excellence.